I’m really impressed with this update. Not because of its headlining feature with Meetup (which I might try thanks to this), but mostly because of the calendar start/end time changes. This was easily the #1 thing I wanted to see change in Fantastical and I’d requested it. I know it’s a common sense feature, and I’m sure I’m not the only one who requested it, but it feels like they’re really listening. I’m also optimistic about the #1 thing I want on Fantastical overall – calendar sets support on iOS – both because of URL scheme support for them in Fantastical 2.5 and because I feel listened to. I just hope it winds up being integrated into the UI rather than just as URL schemes on iOS if/when it does come. What are the changes to calendar start/end times? It’s in the video, but there are more/better ways to adjust the start time independent of the end time (by default, changing the start time of an event moves the end time to keep the event duration constant). Most notably, by holding down ⌥ while editing the time in the info. Would this be the main reason to purchase Fantastical vs Apple Calendar? I’d say the main reason to purchase Fantastical is its excellent natural language parsing to create events. I love the natural language, but I personally find the main reason to be both calendar sets and how incredibly easy it makes it to view the right information at a glance. @Yaakov I can only recommend downloading the trial to see for yourself. I know it looks like a steep price for a default app replacement, but I personally felt it was worth it. I agree it’s an impressive update. I’ve been Fantastical 2.5 for Mac for a few weeks in beta, and it’s great to see it’s now out in the wild. One of my favourite new features is keyboard support for changing the start and end time of appointments (something that @MacSparky covered in the What’s New video). I find this is much more accurate and convenient than using a mouse/trackpad. I still prefer BusyCal on the Mac. BusyCal is great as well. Even though Fantastical is my primary calendar, I sometimes use BusyCal when doing long-term planning and for its excellent Filter feature. I picked up Busycal for Mac as part of a bundle. While I thought it would be nice for certain tasks to supplement Fantastical, it didn’t take root for me personally. To each their own though! All three do different things well. I love Fantastical for adding events with natural language and its automation features. In addition to all these 3, I also use a fourth: Pocket Informant (Mac & iOS). I very much like some of the ways it displays the information, particularly the week view. It took me some time to understand the meaning of all the icons for selecting view, but once I did, I use it as my go-to calendar. Calendar is free; I got BusyCal as part of a deal like someone else. I don’t remember what I paid for the other two, but now when updates come along, I just ante up. And I’m living on Social Security, so I guess it must be important to me. I need to redo my Calendar syncing. Google calendar, Apple calendar, BusyCal, plus my outlook calendar for work meetings and events. I get too many notifications for the same event, and sometimes none for others. I recently added a $7 upgraded Readdle Calendar 5 to my iPad. I wonder if they will roll out a new version for iOS 12. I dont like how Fantatsical for iOS (and Mac, based on the menu bar drop down) have only one view, which is the show all events for that day. It’s hard for me to tell when I have conflicting events which overlaps one another because I have to really look at the start time and end time of each event. Fantasical Mac does this if I opened as an app, but I wish the menu bar drop down showed this view too. Fantastical iOS also show this if you turn the phone sideways. But why oh why I can’t get this view in Potrait mode? I agree. I have purchased Fantastical for all of my devices and there are some aspects of it that I like but at the end of the day I have found that Apple’s calendar has better viewing options. The one caveat is that there is not a monthly view available on the iOS version of Apple calendar. Most of the comments I see regarding Fantastical have to do with the quality of its natural language processing, which I agree is, well, fantastic. However, my executive assistant manages the details of my appointments on my calendar so for me that is not an issue. I may add one or two events a month to my calendar otherwise she handles it. So, other than natural language processing I have not seen any particular advantage of Fantastical over Apple calendar. There is also another small item where they differ. 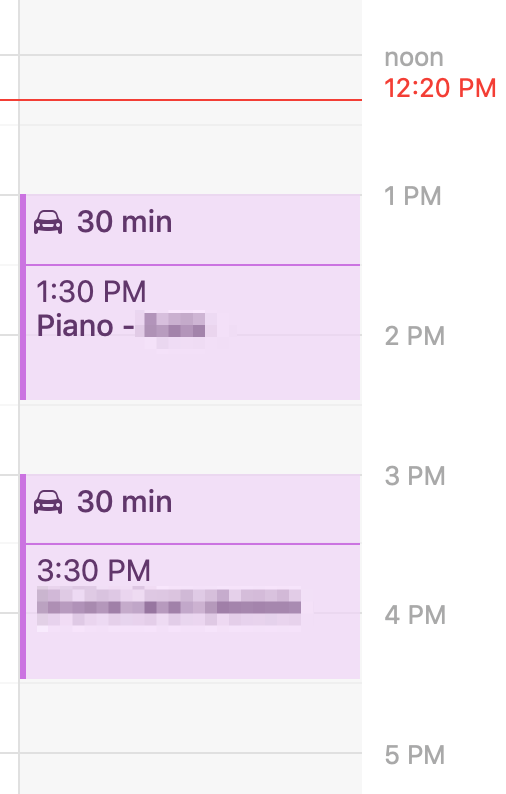 Fantastical and Busy Cal overlap appointments that show up at the same time Making them difficult to read whereas Apple‘s calendar will keep them separated so that you can read the details. I realize you ideally not have overlapping appointments but there are occasions when it happens. Accordingly, my default calendar on all my devices is Apple calendar. This is a complaint I’ve heard a lot, and a good one. I find most people use their calendar apps to keep track of many things each day (including many meetings and appointments that are somewhat variable). Fantastical’s hybrid agenda & monthly view works better for me for the way I use my calendars than any other app, though. My most important “calendar set” is the things that are happening irregularly (doctor’s appointments, major events) and my day-to-day schedule generally doesn’t require me checking my calendar. Fantastical on iOS has the calendars that reflect this loaded, and is identical to the calendar set on my mac that I have up most of the time. I have other calendar sets on my Mac that have more calendars (every sporting event the school I work at has, every group using our building), and I have that in other calendar apps right now on iOS. Ideally, I could use a different calendar app on iOS to manage something like my full teaching schedule in week view, but I’d rather be able to manage the things I already keep in a different app in a separate Fantastical calendar set. The one caveat is that there is not a monthly view available on the iOS version of Apple calendar. And there in lies the issue - why pay so much for Fantastical? I’d think a 3rd party app need to match the features of what the first party app offers and more! By not having the view I described above, I don’t see myself using Fantastical and instead went back to the stock app.